Benchmark. I wrote about it just last month in my coverage of the wonderful 2009. Since then, I’ve been very curious about the potential of the 2013 and after speaking with Tignanello Estate Director Stefano Carpaneto, he simply laughed and said: “Try it”. Who was I to quibble? But for the moment, let’s take a step back and see how we got here. It was 1971 and Piero Antinori was growing restless with the DOCG rules that required blending of inferior red and white grapes with Sangiovese in order to label wine Chianti Classico or Chianti Classico Riserva. He was adamant in his belief that great Tuscan wines, new renaissance style wines, could be created by eliminating, especially the white grapes, and concentrating on Sangiovese. Steadfast in that conviction, Antinori shunned the regimen of the Consorzio and began bottling Tignanello which bore the lowly proclamation of “Tuscan Table Wine”. Since that time, Tignanello has been 80-85% Sangiovese with the remaining percentages devoted to Cabernet Sauvignon and Cabernet Franc. A new standard bearer was born. Today, the Tignanello estate covers 320 acres of vineyards and is home to the iconic Tignanello and Solaia, arguably two of Italy’s most transformative wines. The estate is located in the heart of the Chianti Classico region, just 19 miles south of Florence and enjoys exceptional exposition between the Greve and Pesa river valleys. So, in taking Stefano’s advice, we grilled a nice flat iron steak to a perfect rare, had some pan roasted purple potatoes and a wedge salad with bacon and gorgonzola, and then decanted the 2013. 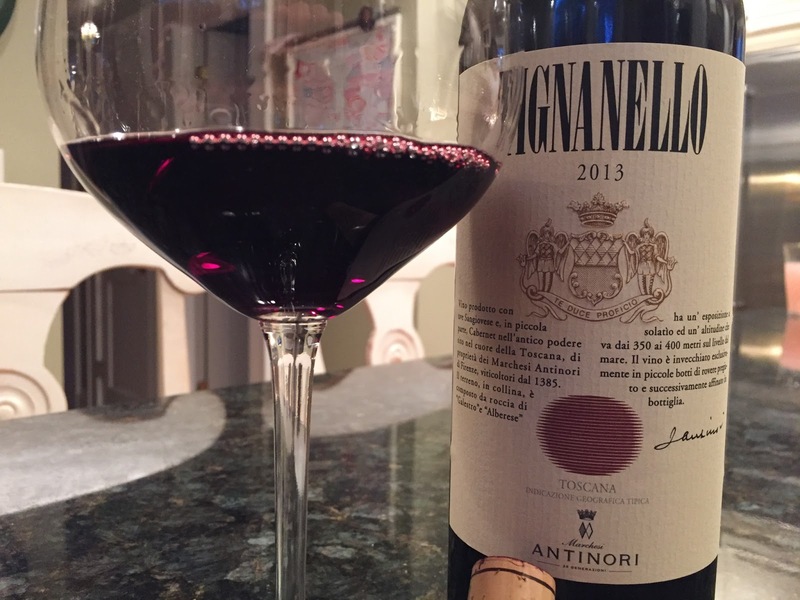 The most recent release of Tignanello is nothing short of masterful. In the glass, the wine is a nearly opaque ruby color. The classic hallmark to Tignanello for me has always been its rich, pipe tobacco aroma and this vintage delivers that in spades. Backed by cherry, anise and fresh floral notes, this wine is expressive to an exuberant point. On the palate, the flavors echo the nose with refined persistence an aristocratic axis between fruit, tannin, and acidity. The drawback if there is one, is that this is very young and will develop so much more complexity with aging. I say that confidently because I know the vineyard, the wine, and the track record. For those wanting that bottle sweet, nuance filled orchestration, put this away until it’s 15 years old. I’ll be 60 then. (yikes!) I wonder if I’ll have the patience. When I’m writing from Tuscany then, I promise to link back to this article if I can manage to save a bottle of this until then. For now, Salute! And buon fine settimana. 96 points. Cellar Selection.